Dip recipes can be very useful during the holiday season. It’s easy to whip up some dip for an appetizer or even dessert. This post is sponsored by Foodie, but all opinions are my own. Creating collections on Foodie.com is easy and like bookmarking delicious recipes. I could spend hours on the site drooling over all the scrumptious looking pictures. My sister-in-law is hosting Thanksgiving this year. She asked me to bring a side, a dessert, and an appetizer. I was trying to think of an easy appetizer that transports well and that won’t require any cooking. Since her oven will be occupied, it’s best that we bring an appetizer that’s ready to serve. Dip recipes are ideal for that. I have a couple dip recipes that I make quite often, but I really wanted to explore what else is out there. People get super creative with dips. There’s so many of them and in a wide variety of flavors. I think I found enough dips for a before-dinner appetizer and an after-dinner dessert! My original thought was to have a nice fruit and/or veggie dip, but after seeing all the sweet ones I may have changed my mind. Seriously, turtle cheesecake dip? Just hand me a spoon. And I love the idea of using pretzels for a whole salty/sweet combo flavor. Yum. Not sure I can wait until next week to try some of these dips! What kinds of appetizers do you serve or bring for your holiday feasts? Do you have any favorite dip recipes? 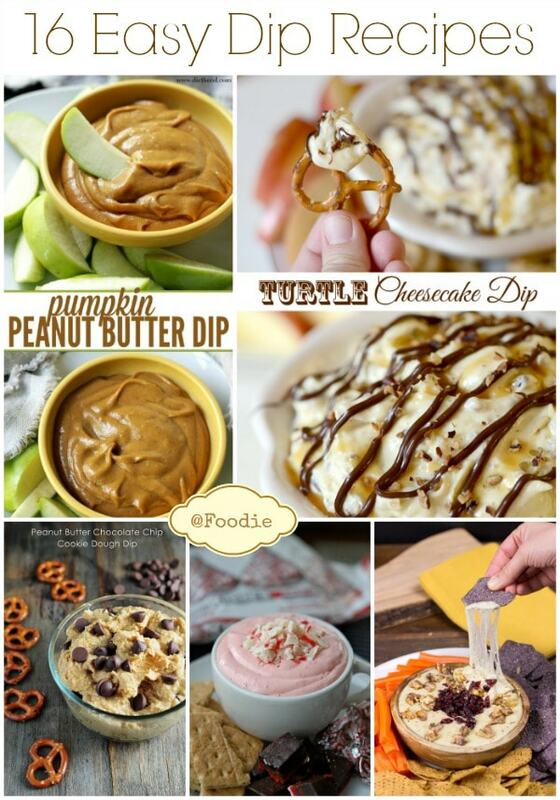 These all look like great dips, I love the peanut butter one, I could make a few of these to put out at holiday parties. These dip recipes look delicious! I really like the Pumpkin Peanut Butter Dip. I will have to make this for the Holidays. Thanks for sharing. Ohh looks yummy! I will have to try for sure 🙂 Thanks for the great recipes! The pumpkin peanut butter dip sounds delicious! For appetizers, we usually don’t have much- save up for the main course! These do look good! I need to make one ASAP! I have to say, I am a big fan of dips. Thanks for the roundup. Omg every single one of these recipes look absolutely amazing!!! So so yummy!!! Well, I didn’t have any fave dip recipes before, but oh my gosh, do I ever have some now. I want to make a party table full of them! Whoa! I love me some dips. I have a recipe linky on Fridays if you would like to share any of yours with my readers too! HAPPY THANKSGIVING and have a great day. Super easy and yummy! Thanks for rounding up ! I like savory dips, I’m not a huge fan of sweet ones. Although, some of those look amazing for dessert! Yumm! These are look so good. I’m a fan of savory type of dips. The Pumpkin Peanut sounds great. The dip that I usually make to bring to parties is a seven layer dip Thank you for sharing these recipes, I’d like to try the Creamy Cranberry and Swiss Cheese Dip. Loving the cheesecake turtle dip. Funny how most people never think to serve these dips with cookies, this is a great dessert idea! Thank you for sharing this great collection. I’ll definitely have to keep a few of these in mind. Looks so yummy and delicious! I love the Pumpkin Peanut Butter Dip and Cheese cake dip. I will have to make a few of these for holiday parties. Thanks for the great recipes! I like the looks of these dips. Too late for tomorrow, but for later. Thanks. SO many awesome dip ideas. I think I’d love that turtle cheesecake one. I like these ideas, I always do savory dips but any of the sweet ones would be a nice change. Every one of these dips sounded so delicious. Maybe that will be my actual gift to a few of my neighbors for Christmas. The Turtle Cheesecake Dip looks so delicious. There are so many wonderful dip recipes here. Thank you for sharing. Peanut Butter Dip! You are a genius and I made this. I had Graham Crackers and apple slices, cute! That Turtle Cheesecake dip looks AMAZING! all these look so good but i would like to try the turtle cheese cake for sure….